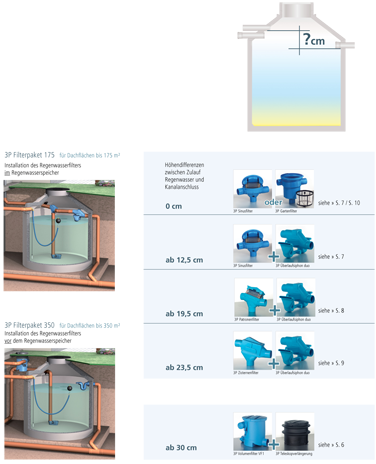 When fitting a rainwater filter inside a water tank in combination with an overflow siphon – the system will only function correctly when the overflow lip of the siphon is sitting lower than the bottom invert of the in-tank filter outlet. If the siphon is installed at the same height or higher, the tank will drain down through the filter. If this happens (or where there is no separate dedicated overflow outlet fitted at all) then the dirt floating on the free water surface inside the tank cannot be cleaned. In this case the suction of the dirty water layer is not achieved, and in time odour problems will arise. For this reason the 3P overflow siphon duo already comes with an integrated height difference. The suction lip is set at a height that very little water is lost yet an efficient skimming overflow function is guaranteed. Our PDF table will help you with your choice. But please contact us at any time for further advice.